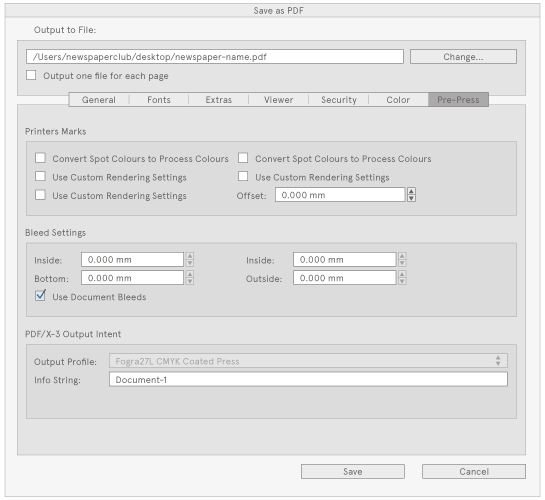 This is a guide to help you convert a newspaper designed in Scribus into a PDF ready for upload to Newspaper Club. 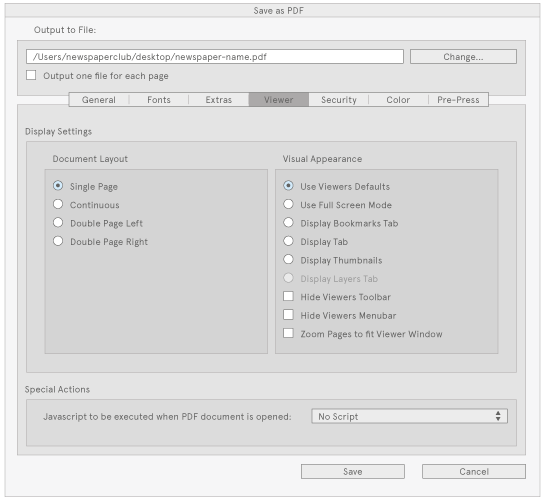 If you're not using Scribus to design your paper, we've produced some instructions that are common to every desktop publishing package, as well as guides for other pieces of software. 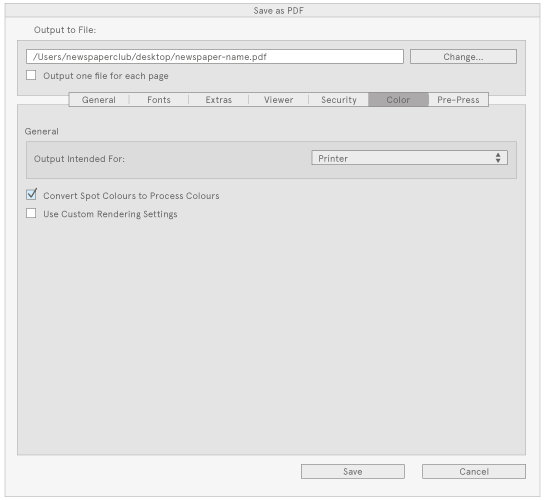 There are a few settings that need to be checked before you export a PDF from Scribus for upload to Newspaper Club. 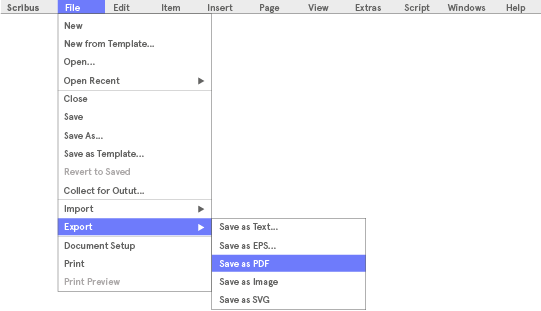 To start exporting your PDF, click ‘Export’ from the ‘File’ menu. 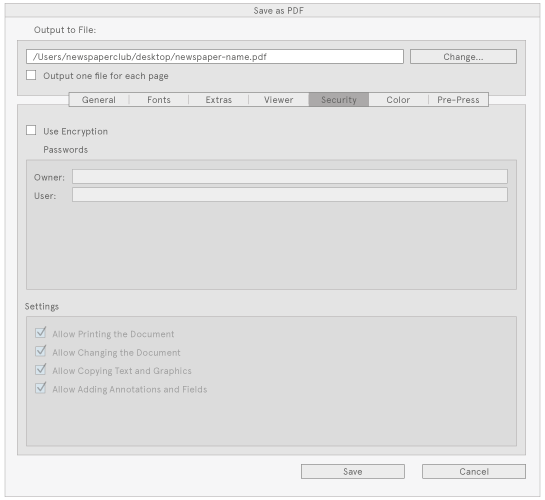 Set the ‘Compatibility’ to PDF 1.3, to ensure only the simplest PDF features are used in your file, making it most compatible with our printers. 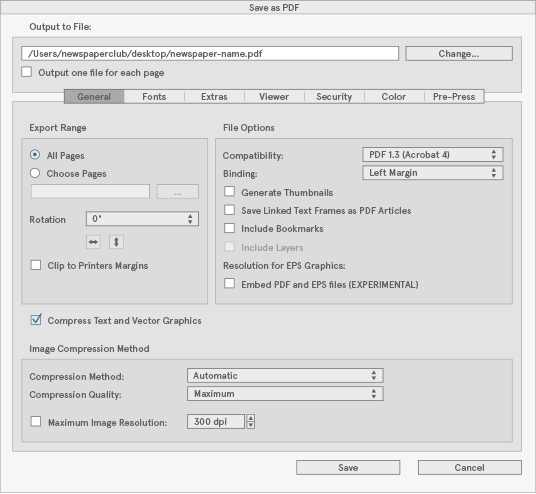 Also, ensure ‘Compress Text and Vector Graphics’ is ticked, and set the ‘Maximum Image Resolution’ to 300 dpi. Make sure all of the fonts listed in ‘Available Fonts’ are also listed in either the ‘Fonts to embed’ box, or the ‘Fonts to outline’ box. You can move fonts between the two boxes by selecting them and clicking on the arrows. Ideally, you want to embed them all, but some fonts can’t be embedded in Scribus, and must be outlined instead. 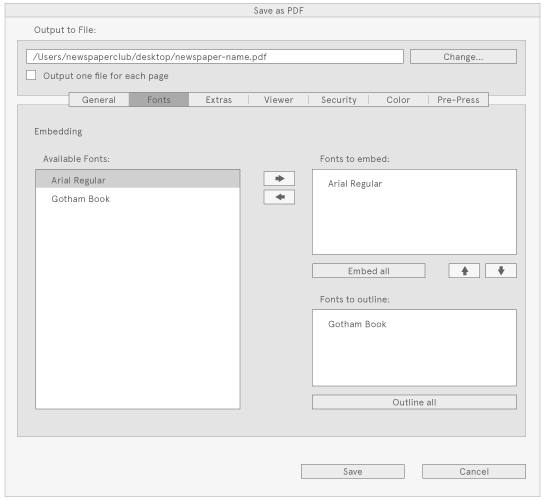 Scribus will automatically move fonts it can’t embed to the ‘Fonts to outline’ box, so as long as they’re in one of these two boxes you don’t need to worry about it. Ensure that ‘Enable Presentational Effects’ is unticked. You shouldn’t need to change anything here. You must not change anything here. 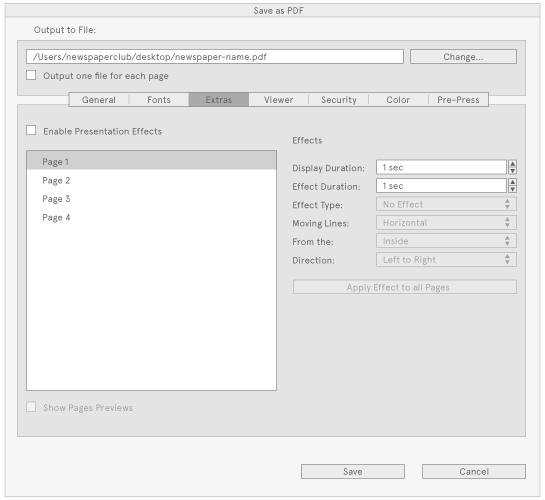 Ensure you select ‘Printer’ under ‘Output Intended For’ — this is very important. Otherwise your colours will be set to RGB, not CMYK. Also, tick the ‘Convert Spot Colours to Process Colours’ box. This will ensure that any spot colours you may have accidentally used are converted to CMYK.